Back pain is one of the leading causes of disability and can be a huge burden on those suffering with the condition. Whether yours stems from joint inflammation, bone damage, osteoarthritis, muscular problems or something else, the best way to prevent and reduce back pain is to stay active. Sitting for long periods of time and skipping exercise is common when back pain is present, but this only increases spinal pressure and decreases your chances of healing. Before you call for the nearest physiotherapist or reach for the painkillers, try these three exercises to strengthen your core and keep your back in tip-top shape. Start on all fours, with your knees hip-width apart and your hands directly underneath your shoulders. Keep your back straight and your head in a neutral position. Think of your neck as an extension of your back, with one straight line from top to bottom. Move your head to look straight ahead, inhaling as you raise your chin and tilting your head up slightly. As you do this, push your navel towards the floor and lift up your tail bone, arching your back downwards. Take three deep breaths and exhale, bringing your navel towards your spine and lifting your spine towards the ceiling. Lower your chin to your chest as you do this and push upwards through your shoulders to create a gently rounded back. Take three deep breaths and exhale into your starting pose. Repeat for 10 reps. Tilt your way to lower back pain relief with this simple but effective exercise, which comprises small, subtle spinal movements to strengthen muscles in the bottom of your back. It’s basically a little massage for your back that can work wonders. Lie on your back and place a small cushion under your head. Place your feet hip-width apart and bend your knees. The natural curve of your spine should be slightly elevated from the ground, with your upper body relaxed. Gently flatten your lower back into the ground as you contract your stomach muscles. Tilt your pelvis towards your heels to feel the little arch in your lower back. Keep your buttocks on the floor to feel your back muscles contract. Return back to starting position. Repeat for 10-15 reps. Lie on your back with your knees bent and your feet hip-width apart, flat on the floor. Using both hands, interlace your fingers just under your right knee and gently pull it up to your chest. 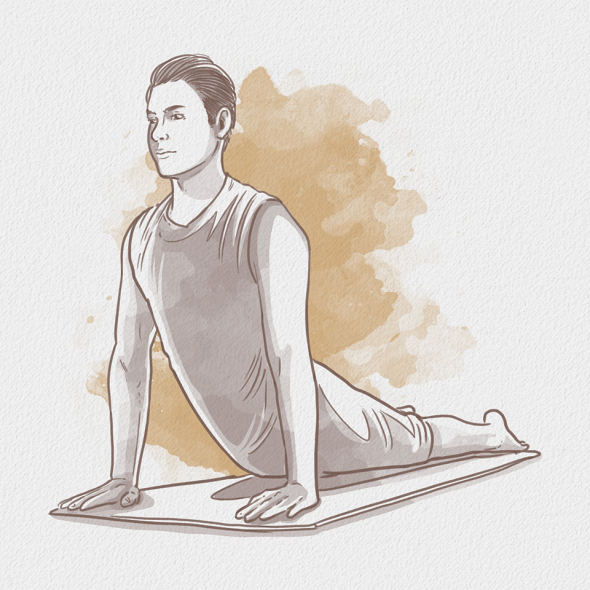 Tighten your core, pressing your spine to the floor and hold for a few seconds. Slowly return your leg to the floor and repeat with the left knee.